Need more information about booking Home 9055213 ? 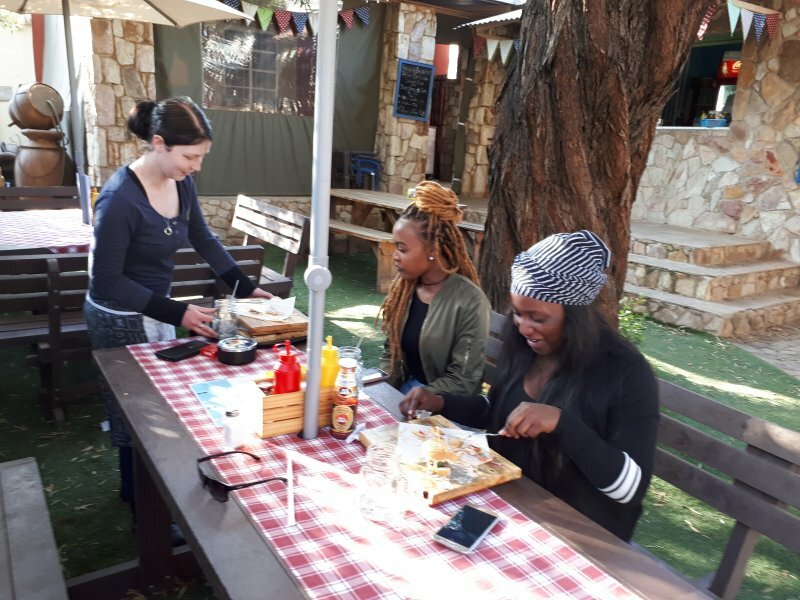 The Heritage Backpackers is situated in the town of Heidelberg, of the same name as the town in Germany, lies just off the N3 highway roughly 50 kilometres outside of Johannesburg at the foot of the Suikerbosrand. What began as a trading store built on a farm out here called Langlaagte, is today a rather big town probably best known for its association with the popular Woodstock Music Festival. Another reason Jo'burgers head out to Heidelberg is to visit the Suikerbosrand Nature Reserve - a fair size nature reserve named after the sugar bush or Protea Caffra. It lies within an hour's drive of the city and its major feature is the Suikerbos Mountain Range that serves as the backdrop to a network of backpacking hiking trails and a 60 kilometre tourist route you can do by car. Get an early start if you're planning on a summer hike at Suikerbosrand as it can get pretty warm during the day. Heidelberg has a fairly interesting history. It was briefly the capital of the ZuidAfrikaansche Republiek (South African Republic), which was an independent Boer-ruled country during the second half of the 19th century and occupied the area later known as Transvaal. It was annexed by the UK during the Second Boer War but some of the initiall homesteads and buildings still stand. The Heidelberg Transport Museum is housed in the old sandstone railway station, and the Dutch Reformed church is a provincial heritage site. And if you really want to find a reason to visit: the Heidelberg cemetery is home to the grave of Count Heinrich von Zeppelin, the uncle of the inventor of the airship. The place is run by owner mokoena who has a vast experience as a flight attend with the international airline who has a passion about South African tourist attraction and always willing to go an extra mile in taking his guests on local tourist attractions and ventures. You can get in touch with S Mokoena (the owner) through the contact form on this page. Send S Mokoena (the owner) an email through the contact form on this page. Alternatively, if there’s a phone number on this page, you can call them. How do I contact S Mokoena (the owner)? If you’ve already booked, go to Manage your holiday booking to view S Mokoena the owner's contact details or send them a message. Or send S Mokoena (the owner) an enquiry through the Contact the owner/manager form if you’d like a quote or more info first. When you pay online through the Book your stay form, a booking request is sent to S Mokoena (the owner). You’ll find out within 24 hours whether they’ve accepted - no money will leave your account before then. You can also request a quote from S Mokoena (the owner) through the contact form. The owner will email you the total cost for your dates and a link to book and pay online. Use the Book your stay form to pay provisionally online. You can pay by credit/debit card or PayPal. S Mokoena (the owner) will have 24 hours to accept the booking and no money will leave your account before then. Why can't I call S Mokoena (the owner) before booking? You’ll need to contact S Mokoena (the owner) to do this. Send them a message in Manage your holiday booking or through the contact form on this page. You can request to change the dates or number of people on your booking via the Manage your holiday booking page. To change your holiday dates use the Edit booking button. If you need to change the number of guests staying then send S Mokoena (the owner) a message. If S Mokoena (the owner) agrees, they’ll send you a revised quote outlining the changes. You can review and accept/decline this from the Manage your holiday booking page. You’ll have 48 hours to take action before the revised quote expires.